On 27th December 1673, the feast of St John, Sr Margaret Mary Alacoque was alone at prayer before the Blessed Sacrament. Her life from age 8 had been marked by suffering, bereavement, illness and great unhappiness in the home. Suddenly she was pervaded by the presence of Jesus who now permitted her to rest her head against His breast (as the apostle John had done). As she did this, He began to reveal to her the wonders of his love and the mysterious secrets of His Sacred Heart, a Heart that was "so aflame with love for the human race". These treasures of His Heart, He told her, were to be spread throughout the world in order to enrich mankind. 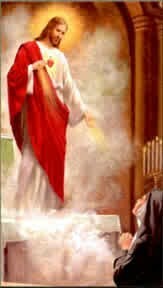 Thus began a series of apparitions in which Jesus appeared to her with His Heart 'like a sun, ablaze with a dazzling light'. 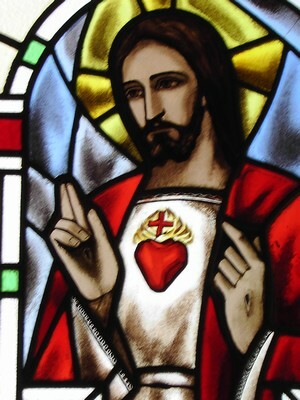 Later He showed her this Heart, with a visible wound, surrounded by thorns and a cross above it, and told her that ". . wherever the picture was exposed and honoured, he would lavish His graces and blessings". On another occasion, when the Blessed Sacrament was exposed, she saw His five wounds 'blazing like five suns'. He repeated the excess of love He felt for mankind, who had nothing for Him " but ingratitude and indifference". He added, " If they would render Me some return of love, I would think little of all I had done for them, and would wish, were it possible, to do even more". To make reparation for these ingratitudes, He asked her to go often to Communion, especially on the first Friday of each month, and to watch for one hour in prayer each week in His company before His Father. In the great apparition of 14 June 1675, Jesus spoke again of man's response to this sacrament of Love as one of "ingratitude, irreverence and sacrileges, coldness and contempt". It was on this occasion He called for a special feast day on the first Friday after the Octave of Corpus Christi, to honour His Heart, to receive Holy Communion and to make a solemn Act of Reparation. To encourage devotion to His Heart, Jesus made a number of promises through St Margaret Mary: "To all those who receive Holy Communion on the First Friday for 9 consecutive months, I will grant the gift of final repentance. . . I will give to my faithful all the graces necessary in their state in life. . .I will bring peace to their homes . . I will comfort them in their sufferings . . . I will bless their undertakings . . .Sinners will find in My Heart the source and infinite ocean of Mercy".